I'm not a vegetarian, but my dog is! Add the quinoa, water, salt, lime juice, and cilantro to a medium pot. Stir well. Bring to a boil, then cover, reduce heat to low, and simmer for about 15 minutes. Set aside and keep covered. Meanwhile, add olive oil in a large skillet on medium high heat. 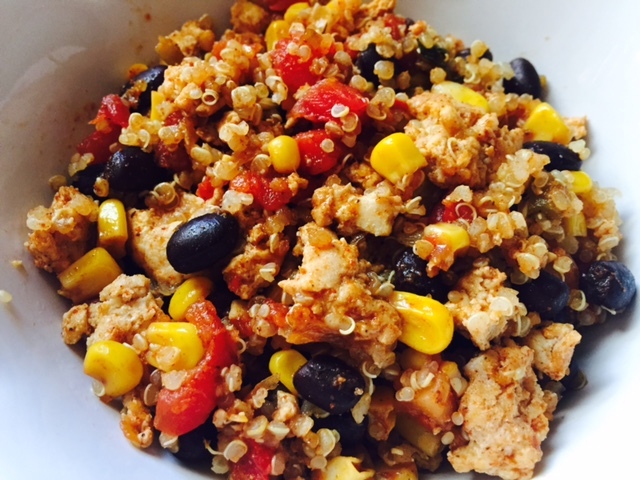 Add ground chicken and half the taco seasoning in a skillet and cook until browned. In the same skillet, add the onions and remaining taco seasoning. Cook, stirring occasionally, for about 5 minutes. Decrease heat to low, add garlic, and stir until combined and fragrant, about 30 seconds.